Grand Opening of the Innovation Loft - Innovation Loft | UNLEASH YOUR TEAM’S POTENTIAL! 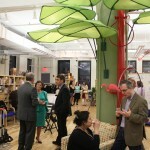 Innovation Loft celebrated it’s official grand opening on April 10th. Innovation Loft friends, colleagues, and team members joined together for an event where they were able to tour the innovative space, participate in collaborative games and activities, and mingle and enjoy refreshments. FROM’s Innovation Loft is planning a number of Open House events which will provide people the opportunity to come experience mini-brainstorming sessions and meet the team! To get a full idea of our space and services, visit Innovative Corporate Meeting Space for a more detailed look at our unique workshop environment. If you have any other inquiries about our space or services, please don’t hesitate to email info@innovationloft.com or give us a call at 646-692-3522. Check out some moments from the event! Small bites and lots of introductions. Some of our innovators wearing Innovation Loft teal. Happy participants at the grand opening event. Great turn out with loads of support. Breakout areas allow participants to have discussions in smaller groups. At Innovation Loft, we encourage silliness! Our flat-screen displays can be customized for your event and project any graphic you need.